The program is mounted in collaboration with the University of Barcelona, founded in 1450, the oldest university in Catalonia and the second largest in Spain. Spend three weeks studying at the University of Barcelona. Experience college life while living in one of the world's great cities. Earn a Columbia University Statement of Completion and evaluation letters from University of Barcelona teachers. 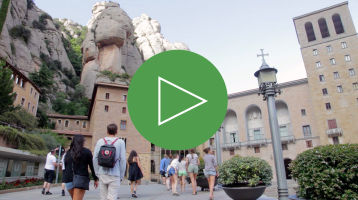 Students examine the history, art, urban development, and language of Barcelona, enriching their understanding of how European communities develop local, regional, national, and international identities. Students share a common three-course curriculum taught in English, supplemented by a Spanish-language workshop. University of Barcelona faculty members teach the courses. Academic work breaks out of the classroom and into the city itself as classes visit sites of historical and cultural relevance throughout Barcelona. Additionally, two days are devoted to visiting important sites outside of the city. Students live in a state-of-the-art University of Barcelona residence hall and are supervised by a trained and experienced residence life staff. The site director and resident advisers, in addition to providing for the safety and well-being of the students, organize various cultural and recreational activities around Barcelona. Conducted in English, this program is open to students entering grades 11 or 12 or freshman year of college in the Fall.